Just ahead of Paris air show, Boeing Commercial published its yearly update of the Current Market Outlook (CMO) for the next 20 years of commercial aircraft market (2015-2034). CMO 2015 vs 2014 comparison. You can see that the total number of new aircraft delivered has slightly increased from 35,930 to 37,130, a 3.3%, which is consistent with the 4.9% traffic increase (1) that Boeing predicts (2). small wide-body segment with 230 more aircraft (+5%) and an increase in volume of 100Bn$ (+9%). Two years ago, I wrote about a sudden change between CMO 2013 and CMO 2012 of the mix in wide-bodies; in this respect, CMO 2015 is consistent with last year’s one, showing simply a slight increase in demand for both sub-segments. Interesting to note how Boeing continues to downplay the large aircraft segment (-16% in terms of number of aircraft) at the moment when a A380neo is discussed. This year study’s figures and presentation focus on single-aisle (737 MAX, “fuelling forecast”) and small wide-bodies (787, “re-shaping long-haul marketplace”), the products to be pushed by the sales force. 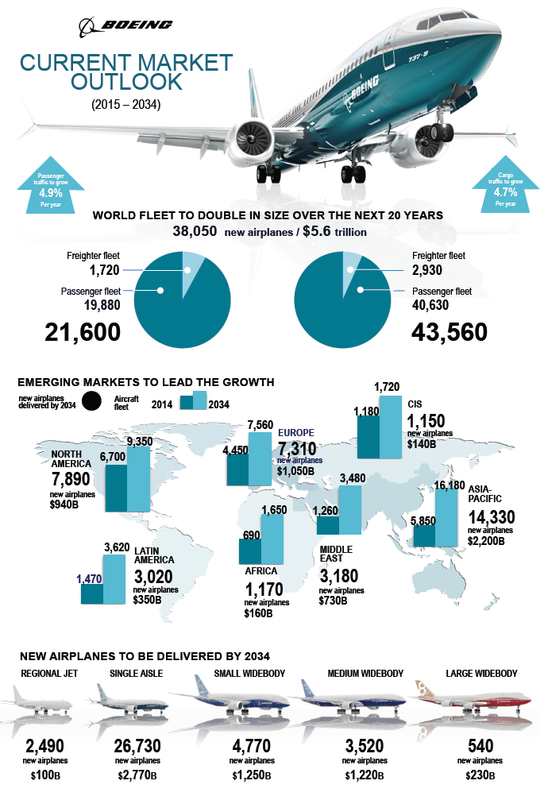 Boeing Commercial Aviation Market Forecast 2015-2034 infographic. As always, I recommend going through the CMO, as you can learn a lot about the business: from global numbers, to growth, traffic figures, fleet distributions, forecasts, etc… You may find the presentation [PDF, 3.8 MB], a file [XLS, 0.6 MB] with all the data or the full CMO report [PDF, 6.5MB]. For a comparison between this CMO and the respective Airbus’ GMF we will have to wait until after the summer, when Airbus publishes its update. Until then, find here the comparison based on 2014 market studies. This year together with the CMO, Boeing provides two interesting papers from a couple of years ago: “Key Findings on Airplane Economic Life“ [PDF, 0.3MB, dating from August 2013] and “A Discussion of the Capacity Supply -Demand Balance within the Global Commercial Air Transport Industry“ [PDF, 0.6MB, dating from August 2013]. (2) These two ratios, 3.3% fleet demand and 4.9% traffic growth, point to an implicit increase in the average size of the aircraft in fleet and / or a higher utilization of the aircraft (higher availability). (3) Find the reviews I wrote comparing 2014 CMO with 2013 CMO and 2013 CMO with 2012 CMO. Just ahead of Farnborough air show, Boeing Commercial has published its yearly update of the Current Market Outlook (CMO) for the next 20 years of commercial aircraft market (2014-2033). CMO 2014 vs 2013 comparison. You can see that the total number of new aircraft delivered has slightly increased from 34,430 to 35,930, a 4%, which is consistent with the constant 5% traffic increase that Boeing predicts (1). medium wide-body segment with 180 more aircraft (+6%) and an increase in volume of 70Bn$ (+7%). Last year I wrote about a sudden change between CMO 2013 and CMO 2012 of the mix in wide-bodies; CMO 2014 is more consistent with last year’s one even if the trend is reverted again. This year study’s figures seem to push for the 737 and 777, which is backed by the presentation as well. It is curious how 777 market is increased whereas 787 is slightly decreased. Boeing Commercial Aviation Market Forecast 2013-2032 infographic. As always, I recommend going through the CMO, as you can learn a lot about the business: from global numbers, to growth, traffic figures, fleet distributions, forecasts, etc… You may find the presentation [PDF, 10.6 MB] and the file [XLS, 0.7 MB] with all the data. For a comparison between this CMO and the respective Airbus’ GMF we will have to wait until after the summer, when Airbus publishes its update. Until then, find here the comparison based on 2013 market studies. (1) These two ratios, 4% fleet growth and 5% traffic growth, point to an implicit increase in the average size of the aircraft in fleet. (2) Find the review I wrote comparing 2013 CMO with 2012 CMO. 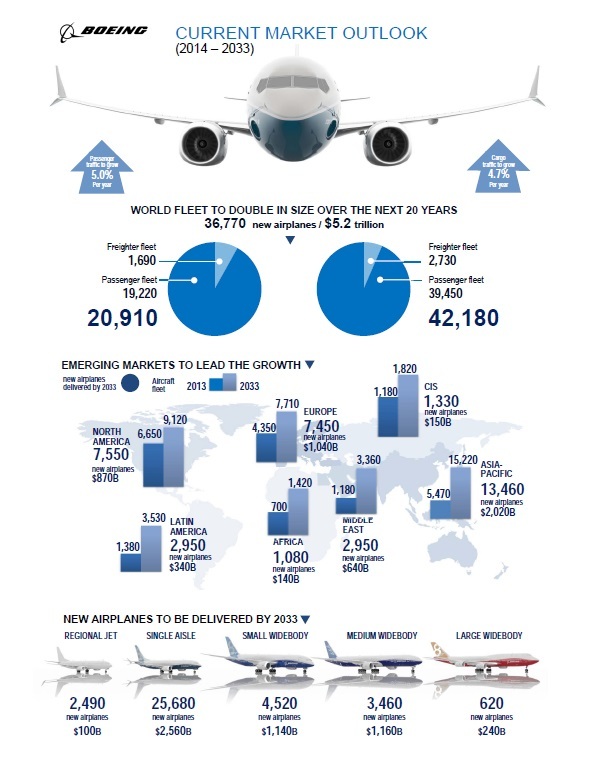 Last week, just ahead of Le Bourget air show, Boeing Commercial published its yearly update of the Current Market Outlook (CMO) for the next 20 years of commercial aircraft market (2013-2032). CMO 2013 vs 2012 comparison. You can see that the total number of new aircraft delivered has slightly increased from 33,060 to 34,430, a 4%, which is consistent with the constant 5% traffic increase that Boeing predicts. as you can see the combined figure slightly changes (7,130 vs. 7,210), however the distribution among the two categories is drastically changed. Why is that? A question to Randy Tinseth that he did not address in his blog when the CMO was unveiled. I would tend to think that the move is done to push some market development based on some models (787) instead of others (777), but given that it is precisely now when the upgraded versions of the 777 are supposed to be pushed into the market I fail to see the logic behind this. As always, I recommend going through the CMO, as you can learn a lot about the business: from global numbers, to growth, traffic figures, fleet distributions, forecasts, etc… You may find the presentation [PDF, 9.6 MB], the booklet [PDF, 3.0 MB] and the file [XLS, 0.4 MB] with all the data. For a comparison between this CMO and the respective Airbus’ GMF we will have to wait until after the summer, when Airbus publishes its update. Until then, find here the comparison based on 2012 market studies.